Well, here's your chance to ring in the new year without suffering from Overrated Holiday Syndrome: Throw a party to celebrate Chinese New Year. The Year of the Ox begins on January 26. To get you started, we've given you a few of the fortunes-with-attitude our guests will find when they crack open a cookie, plus our easy recipe for the cookies themselves. Try it at your own party. 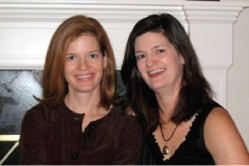 We predict: A good time is in your future! 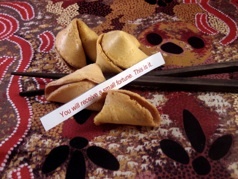 Use a computer to create fortunes; print and cut them into strips about 2 ½ inches long so the ends will stick out of the cookies slightly. Have the fortunes ready to go before you start baking. Preheat oven to 300° F. Lightly oil a baking sheet. In a food processor, combine all ingredients and process until smooth. Drop 6 scant tablespoonfuls of batter onto the baking sheet. (Set the rest aside.) With the back of a spoon, spread each dollop into a 3¾-inch circle. Bake until quite golden, 10 to 15 minutes. Have a small bowl and a muffin tin ready. When the cookies are done, loosen them with a spatula but leave them on the baking sheet. Remove one to work with, and return the rest to the oven to keep them pliable. Your next passport photo will be exceedingly flattering. Driver's license, not so much. You will attend your high school reunion. So will your high school girlfriend. Both of you will wonder what in the world you were thinking. Yes, the cable company has it out for you. A big lottery win is in your future. Prepare to lose some friends. Prepare to not care. That embarrassing thing you did on New Year's Eve? Everybody still remembers. You will achieve your dream. Hope it's not the one about being naked in front of a crowd. You will receive a small fortune. This is it.